Daimler is looking to re-establish the Smart brand's position as an urban mobility pioneer with the first mass-produced electric auto from a German manufacturer. FRANKFURT (Bloomberg) -- When Daimler introduced the diminutive Smart car in 1998, the vision included a smog-reducing electric version to cement the brand's image as an urban transport leader. While that model is finally becoming reality, Smart was long ago overtaken in citycar innovation. BMW Group's Mini has rolled out variants that range from a roadster to a four-door crossover, serving as a stepping stone to the parent BMW brand. Smart, by contrast, offers just a single model and has done little to lift Daimler's Mercedes-Benz, which fell behind Audi in sales for the first time last year. Daimler is looking to re-establish the brand's position as an urban mobility pioneer with the first mass-produced electric auto from a German manufacturer. The car starts deliveries in the coming weeks, including the United States. "Daimler has some catching up to do," said Peter de Haan, an auto markets analyst at consulting company Ernst Basler + Partner in Zollikon, Switzerland. "The e-Smart is of symbolic relevance for the whole company." With Smart owners driving less than 50km (30 miles) a day on average -- easily within the electric version's range of 145km per charge -- the emission-free model is a good match for its space-saving size, said Smart brand chief Annette Winkler. "From the beginning, Smart was designed as an electric vehicle," Winkler said in a written response to questions. "That's now paying off, because the electric drive suits our car perfectly." The battery-powered model is part of a broader expansion of Smart. In coming years, the lineup will also include an electric-powered bicycle, an e-scooter and a four-seat car, similar to a model introduced in the last decade and pulled off the market two years later. Daimler needs the brand to meet tighter environmental rules by offsetting emissions from high-margin sedans like the Mercedes S class. The conventional Smart gets as much as 71 miles per gallon (3.3 liters per 100km) in the city, compared with 22 to 41 miles per gallon for the Mercedes flagship. Still, Ford's Fiesta, which seats five, matches Smart's efficiency. Smart's stuttering expansion has given competitors time to develop vehicles for crowded urban areas. Since 2003, when the brand had 10 percent of the citycar market in Europe, Fiat has brought out the retro-styled 500, Toyota Motor Corp. has introduced the iQ, and Volkswagen has rolled out the Up. Given the competition, Smart will control just 5.5 percent of the segment this year, down from 6.3 percent in 2011, according to data from IHS Automotive. The market researcher doesn't expect Smart to exceed 6 percent in the next five years. Smart's struggles reflect Daimler's difficulty in keeping pace with competitors. Over the past two years, Daimler's stock has declined 9 percent compared with BMW's 31 percent gain and VW's 68 percent surge. Daimler is rolling out the electric Smart about a year ahead of BMW's i3 citycar and a battery-powered version of the VW Up. At 18,910 euros ($24,900) for the car and 65 euros a month to rent the battery, the two-seater will undercut most rivals in a bid to reach a target of at least 10,000 deliveries a year, or about 10 percent of sales for the model. Nissan's Leaf, the world's best-selling electric car, has a sticker price of $35,200. General Motors charges $39,145 for the Chevrolet Volt. The i-MiEV from Mitsubishi Motors Corp. starts at $29,625, while Renault's upcoming Zoe will cost 20,600 euros, not including the battery. 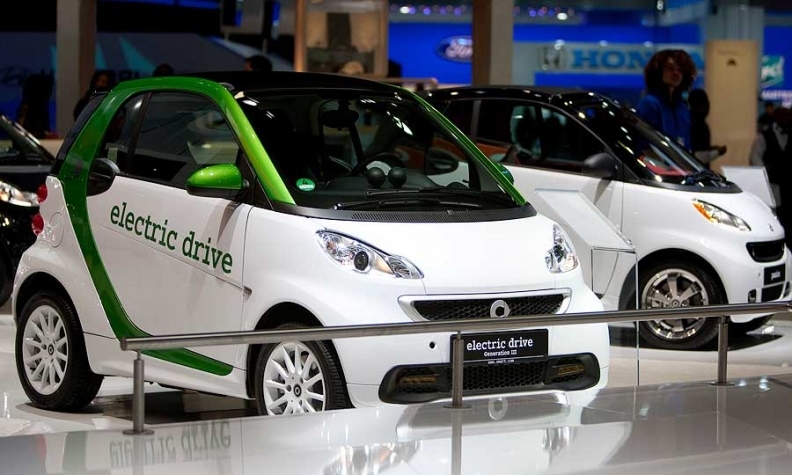 "The potential demand for the e-Smart is huge, because people have been brainwashed toward electric vehicles for the last couple of years," said Christoph Stuermer, an analyst with IHS Automotive, which expects the model to account for as much as 20 percent of Smart's sales by 2015. "The question is if Daimler will be able to make money on them." Profit has been rare for Smart, which started as a joint venture with Swatch Group AG. The watchmaker's late founder Nicolas Hayek was one of the strongest supporters of an electric-powered version. Following Swatch's exit shortly after the brand's 1998 introduction, Daimler expanded Smart with a roadster and a four-seater, only to scrap the models by 2006 as sales fell short of targets, leaving it with just the ForTwo. "You can't make money on only one model, especially if it's a small car, which doesn't yield high margins," said Juergen Pieper, an analyst with Bankhaus Metzler in Frankfurt, who estimates the brand has lost at least 1 billion euros. "The electric drive fits well with Smart." The electric version of the ForTwo will cost almost double the conventional model's base price. The 93-cell lithium-ion battery takes seven hours to recharge from a household outlet or one hour with a fast-charging system. The 55-kilowatt (73-horsepower) electric motor gives the vehicle a top speed of 125 kilometers per hour (78 mph). The e-Smart's rollout will be aided by Daimler's Car2go car-sharing service, which rents ForTwos by the minute in 15 cities in Europe and North America. The service already has electric vehicles operating in Amsterdam, San Diego and Portland, Oregon, offering Smart a distribution outlet and providing a no-risk platform for drivers to test the cars. "Many dyed-in-the-wool Smart drivers will be waiting for the electric version," said Nick Margetts, managing director at market researcher JATO Dynamics in Limburg, Germany. "The Smart is heavily used by local service delivery companies, such as health care or pizza. The e-Smart will appeal to them." Still, Smart's expansion with models that are more versatile and yet consistent with its urban image is critical to expand out of the brand's niche and hold on to fans like Willi Rode. After 10 years of driving Smart cars, the 39-year-old photographer reluctantly switched to a Focus wagon from Ford Motor Co. after starting a family and his own business. "The Smart is a great car if you are single or to use as a second car -- and for city dwellers in any case," said Rode. "In 99.9 percent of all cases, I was able to find a parking space."